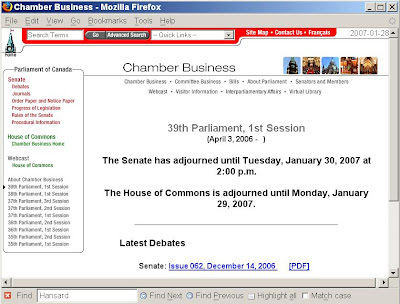 In the Parliament of Canada webpage Chamber Business there is a prominent example of bad design. Parliament of Canada, Chamber Business webpage. For a full-size view, click on the image, or look at the original Chamber Business webpage. This is a textbook example of the blinkered approach to site design that we see far too often in the government's websites. Does any citizen, who is looking for government information — say a Hansard report of a speech by his/her MP — think of the date of that speech in terms of 36th or 37th or 38th Parliament, 1st or 2nd or 3rd Session? Of course not. We the people think of such things in terms of calendar dates. Sure, these official Chamber Business documents are organized by Parliament and Session numbers, and the site navigation has to be organized in the same way, but the navigation should match these Parliament and Session numbers with calendar dates. These dates should appear in the navigation column — or at the very least as cursor hover popups (although hover popups are less satisfactory because different browsers react to them in different ways). Ontario Hansard Index, showing Parliament and Session numbers with calendar dates. 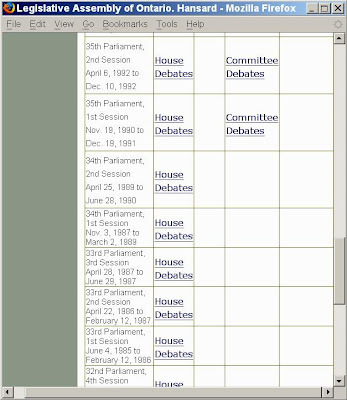 For a full-size view, click on the image, or look at the original Ontario Hansard Index.